Malone with a heck of a block to prevent a shot from getting through. And UW back to the PP as Greenway is whistled for a pretty obvious trip. Greenway is whistled for tripping minor and UW will be down a man for the remaining 1:27 in the period. Still down by two. 1:27 left in the period. #Badgers have to stop committing late penalties. UW's Greenway is called for tripping with 1:27 left in the second. Merrimack back on the power play (0-for-2). 10.4 left in second. Face-off in Merrimack zone after icing. End of the second. 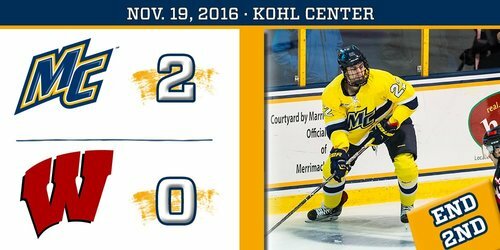 Merrimack 2, Wisconsin 0. End 2: Merrimack leads Wisconsin 2-0. The Warriors will have 33 seconds of power-play time left to open the third. Better period for UW, but nothing to show for it. Still gave up too many chances on the defensive end. Going to need a complete effort on both sides of the ice to salvage this one. If Wisconsin were to win tonight, they'd probably get in the top-20. But a loss would set them back in that department quite a bit. Polls don't matter a whole lot in the grand scheme, but in terms of garnering fan attention, they matter a heck of a lot. Third period is about to begin. Greenway will be in the box for another 33 seconds to start the period. Time for some offense! Puck is DOWN in the third! Merrimack resumes its power play as the third period begins. Back to five aside and that almost led to a breakaway as Greenway came out of the box, but Carle able to break up the attempt. Greenway hops out of the box and proceeds to shoot high. 5-on-5 hockey now. Wagner, per usual, all over the ice. Great puck movement by the Warriors led to a scoring chance, but Berry with a nice pad save. Merrimack whistled for interference. A #Badgers goal here would be huge. Merrimack is whistled for interference 3:05 into the period and the Badgers will have an early power play opportunity. Merrimack's Carle off for interference with 16:55 left in the third. UW goes on its third power play. Kunin with a nasty wrist shot but couldn't get it past Delia. Quite the scrum in front of Delia. Just about everyone dog-piled on the puck in the crease. Somehow stays out. Loose puck in front of the nut and a big pile up but nothing happens of it. Four-car pileup (© @CMehring ) in front of the Merrimack net but the puck stays out. 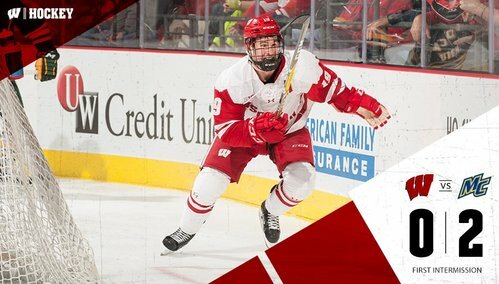 Badgers come up empty handed on the power play. Just over five minutes gone by in the period. Carle's free. Five aside with under 15 to play in the third. Some great chances for UW, but couldn't finish. Power play ends. Delia with his best stop of the night! Puck thrown his direction and he slides to his right and keeps the pad down to keep the puck out. 14:30 left, still 2-0 Warriors. #Badgers pushing hard though. Scrum behind the net with Wagner, McGuire and Larrison from Merrimack. 13:52 left in the third, 2-0 Merrimack. UW has five of the six shots on goal so far in the third. Badgers have cut shot gap down to one. 26-25 Merrimack now. Scramble in front of the Merrimack net is kept from crossing the goal line. Badgers still down 2-0 with just over 13 min left in regulation. Badgers draw a tripping penalty and will have another shot on the power play with 12:09 left in the game. Another power play here for Wisconsin. #Badgers need a goal to ignite a fire here. 12:09 left in the game.